Starting a new one, this time 48"x70". My sorry old computer's already straining with the files at this size and I've only put in the 1" grid lines. This is going to be tricky, and slow. But the plan is to align the textures to the 1" grid, rather than the goes-anywhere approach with my last map. 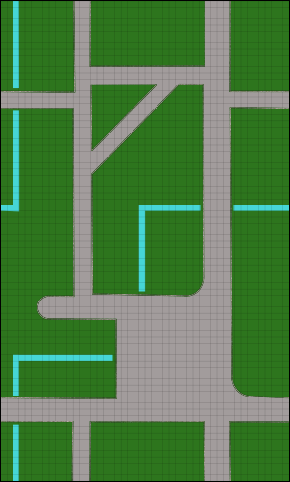 Here's the starting point for the Rake's Corner Map. Each square = 2 inches. There's a canal (blue), and two types of roadways (gray): 3" alleys, and 4" streets with 1" sidewalks on either side (6" together). Rake's Corner is something like the Five Points. The locals are vicious to each other, so you can just imagine how they treat strangers. The town watch is afraid to patrol there. 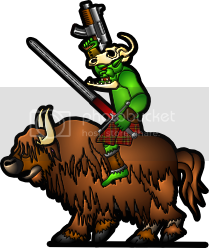 The lawlessness breeds vice, graft and murder. Anyhoo-- I'd like to add an open space somewhere, a market square. Where would you want to see it? Just tell me northwest, southeast, something like that. I'll figure out what you mean. And should I dare to add some angled streets? How important is it that the textures conform to the 1" grid? Sidewalks are actually anachronistic. Most medieval streets I've walked down might have gutters down the side that can sort of separate vehicles from pedestrians, but many just have one gutter down the middle. To get the medieval feel, you really do need angled streets. Could you make a cobblestone texture that repeats in inch squares and run that on the angled streets so people could use that grid for diagonals? Just thinking out loud. 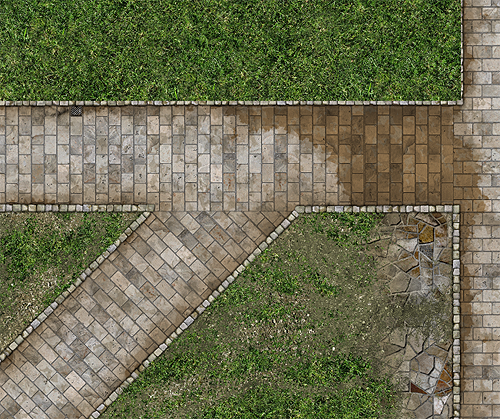 I bought Cobblestone Streets before the announcement and fully expect to put it into my "Heavy use" rotation once I get it printed at full scale on a banner (first time I'm going commercial to print!) 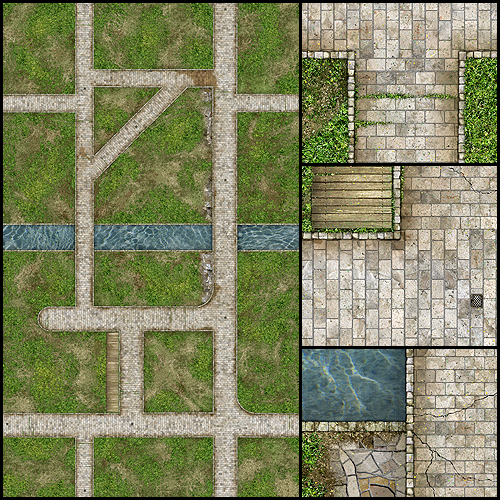 Cobblestone Streets is the first downloadable city terrain map (tiles) that I can't wait to get printed and into my build photos and into play. I may be in the minority, but I must say, the floor plan of this Rake's Corner map leaves me cold. Moving onto the grid decreases it's appeal drastically. I've always thought that the reason for 90-degree-angle street/river/etc. map elements was to make the tiles modular [rotate, re-arrange, etc.] - not to make the combat rules easier. For me, it is easy enough to say "The terrain type in a square is determined by the largest portion" or "most costly portion" and be done with it. Aligning with the grid also increases your constraints and decreases the appeal for non-gridded use. 40k guys seem to relish irregular terrain. I love the artistry of your work, and I don't mean just texture-quality, but the aesthetics. This maps feels like you had to put on a straight-jacket before designing. Do others feel the same way? Or am I just an outlier? The align-to-grid aspect was by request. Sometimes I want to show people what they're asking for to make sure it's what they actually want. I'm okay with either approach, really. But I already know two D&D/Pathfinder players who seem to think this is a normal thing. It does seem restrictive, but this is a straight-on top-down look at it. On the table, with terrain sitting on it, and viewed from a more natural perspective, I don't think the angularity of the layout will seem nearly as stark as it appears here. And I can still build in little kinks and irregularities, since I agree with you that the texture filling the majority of the square should determine what type of terrain it is. It would be cool if the two ends lined up so the map could be scrolled, to adjust the location of the river or other features. It looks like this would require very little adjustment to the design. People who print on 8x10 cards would be able to scroll like this pretty easily. This would would be possible with or without irregular terrain. edit: Just for clarity, I am referring just to having the two short ends lineup. That makes a whole lot of sense. I really don't have a need for this, but knowing several gamers, I get a good sense of how they think. Being able to take one or two of the end rows and put them on the other end would definitely appeal to them. If two guys in the same club wanted to use this layout, they wouldn't want their tables to lay out the same way. A subtle shift on the smaller road at either end would make this much more customizable, and therefore more attractive. I'll go one further and make it tile-able both north/south and east/west, so you'll be able to start with any section and expand it as far as you want in any direction. I've rounded off a couple of corners and there's a cul-de-sac now. Also decided to place the plaza/square in the south central region. Thinking about whether the plaza should have a small communal yard in the middle (grass and dirt), or just pave the whole thing. Votes? I've never been happy with the idea of sidewalks for medieval streets, but I think I have a better solution: flagstones. These can kind of peter out into the grass/mud/rocks mixture. Not all of the roads will have them, and they won't all be neat 1" wide sidewalks. I actually think it would be neat to have like a 2"-3" strip of flagstones along a stretch of the main boulevard. Thinking about the placement of the canal -- and the possible removal of it as a main feature. A 1" canal snaking through the landscape might work better. Thinking about whether the plaza should have a small communal yard in the middle (grass and dirt), or just pave the whole thing. Votes? Why not both? one layer with grass/dirt, and one paved layer. 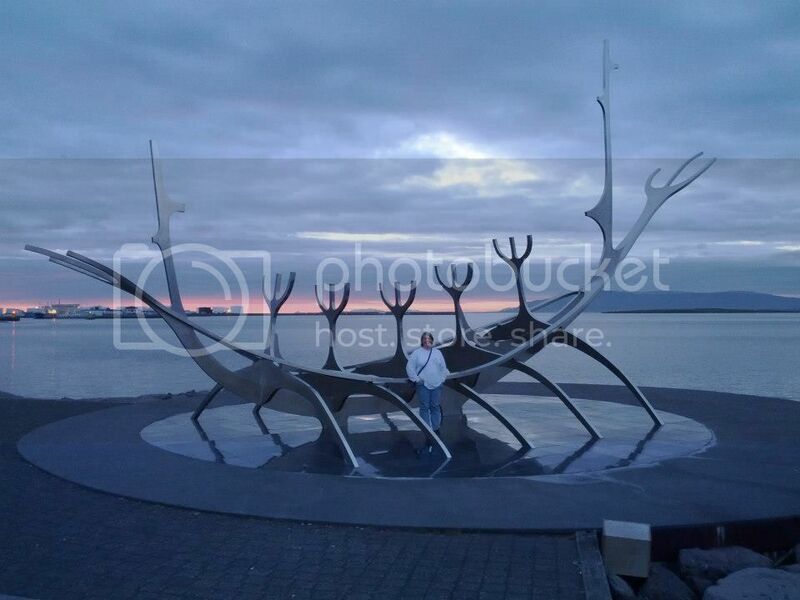 You could also add a base in the middle of it for a fountain or statue. I'm not considering multiple layers for this map, sorry. I like the 2" canal width. I like that it kind of snakes. I think making the long sides match up would force the map to be to uniform. It didn't require many changes to make it match up east/west, so it was already nearly doing that. Doesn't look too uniform to me, and I'm pretty sensitive to that kind of thing. I'll post a work-in-progress shot a little later and see if you agree. A 2" canal would work fine if it didn't need to tile. But since this now set up to be fully tile-able, a wide canal is going to take up too much space. The thinner canal should be a more interesting feature, since you're more likely to run into it and less likely to be impeded by it. You actually have a chance of making a running leap over it. Just in regards to leaping, it depends on the game you play. I don't know about the current d&d rules but in Mordheim leaping 5ft (1") is automatic. This seems about right as I can pretty easily leap 5 ft and don't do any athletic training at all. I am guessing most athletes and athletic RPG heroes could leap 10 feet with just a little risk of failure. For comparison the real world record is over 29 ft. It would seem that the commons in the center of a village might not be paved, so that sheep, etc., could graze on it, but a plaza in a city would probably be paved, otherwise, it would just be muck for most of the year. There would be fountains in the plazas, because that was the only water system there was. People came there with jugs in the mornings to get their water. That traffic is the reason the plaza would be paved. There wouldn't need to be any special provision on the tile for the placing of the fountain. If you plopped a model fountain down just about anywhere on the plaza, it could be appropriate. Here's the revised street plan, but I'm actually not going to use this canal arrangement. I'm just going to have a 4" wide canal running east-west basically in the middle of the map. Christopher Green@DGM's Facebook Page: I would hazard a guess that "oldschooldm" (from the thread in question) does not play 3rd or 4th Edition D&D. While I agree that the usefulness is drastically reduced by conforming to a grid, your suggestion of adding little kinks and irregularities goes a long ways towards bridging the two mindsets. .
Christopher would be wrong in his guess. :-) I'm currently host to two 4e games, and co-authoring a massive 4e campaign book. I keep seeing folks saying that 3e and 4e require 90 degree streets and canals. It simply isn't true. There's no such rule or requirement. In fact, non-perpendicular features on maps have always been a part of the staple of the game. For example - WotC ships game tiles with circular <gasp!> keep walls, staircases, and interiors. Now - with all that said, I do find it interesting how many iterations Dave has had to go through once he made this decision. Once it was 90-degree, the call to tile went out, then he compromised on the water-feature, etc. In the end, I'm expecting a very pretty tile set, much like the town tile sets from other vendors. I have some of those, and have never printed them. Personal taste. I would be perfectly happy with an irregular road layout as long as it was tile-able. Having a fixed layout doesn't appeal to me. This map is one I would actually buy because between the extra length and tiling I can make a large variety of 4'x4' maps. BTW... seems like you have a few extra carriage returns. Gotta have more faith in me than that! This map is still a map, and now that I'm committing to the textures, it's very much what I envisioned for it to start with. Making it tile-able required only a slight change, and I liked the idea. I hadn't committed to anything at that point. Three minutes of work added a ton of versatility to this kit without adding layers. Working on a grid has its advantages, and I'm not a slave to it. There are some rounded edges here. The street texture matches up (which is kind of a relief, it's easier to work with) but the empty lots will be painted up much like the ones in the Cobblestone Streets, with no respect paid to the grid. The concept for the canal basically came full circle. The original kink seemed kind of necessary when there weren't any semicircles or diagonals, but not any more. In the end, I'm probably going to combine the wide canal dividing north and south with the smaller water channels -- which was something I'd had in mind from the start. And it will be tile-able without being obvious about it. I have no problem recognizing and acknowledging when I've made mistakes. I trust my instincts but I also try to be objective. My failure with the Marauder ship was that I had already made a paper test and was happy with it, and at that point I should have committed to the design. Where I went wrong was that I kept exploring the idea well beyond my paper modeling skills (but not my digital modeling skills) and ended up losing sight of the original goal I set and achieved. I learned a lot from that, and I don't regret it at all. Oooh! Thanks for the direct reply. I would *love* it if this map turns my head on tilable sets. If anyone can do that, it is you! Dave, on your gatehouse models, what is the width of the openings? I was just thinking that a map need not be tileable directly across but could be at an angle. For example you could take the bottom left tile, shift the other left tiles down one and place the original bottom left tile at the top and then move all these tiles to the right side. The downside is that people would have to use the correct sized tiles or it wouldn't shift the correct amount. This would be pretty annoying for people that don't like the tile size you pick. 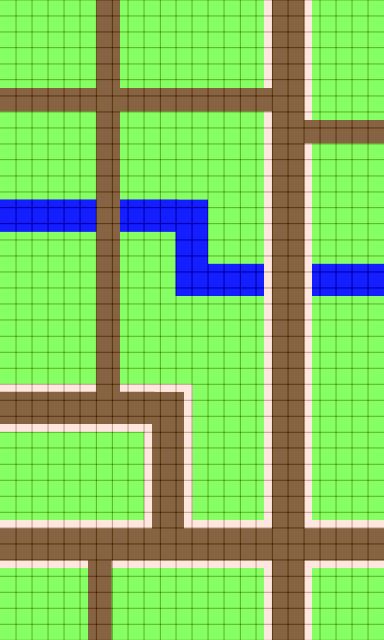 The advantage is that a map might look less like a tileable map, cause the features on the left and right sides of the map wouldn't directly lineup. edit: After thinking about it a little more I am not such a huge fan, but it could be a good compromise between people that want organic maps and people that want tileable maps. Out of curiosity, why 48" x 70"? All my terrain goes on 20" x 30" foamcore boards; sizes that are not multiples of that tend to be very inconvenient, and anything larger that 40" x 60" is just plain Not Happening. I'm actually planning a 40" x 60" in-town layout soon, to go on the reverse side of a 40" x 60" space map that I already have. I had planned to cobble it together manually out of other sets from a variety of publishers, but this could work well. EDIT: Just discovered the 42x60 Cobblestone Streets map, and will probably use that, especially as my target town has no canals. Out of curiosity, why 48" x 70"? 4 foot by 8 foot (48"x72") is one of the most popular table sizes for 28mm wargames. I am working in 7x10 increments (A4/letter), so the 48x70 works better. (I'll have one column that is 6x10). Is there any chance that I could persuade you to move the canal out of the middle, preferably far enough that I could get in a 60" tall sector with no canal? I'm committed to canals at this point, both the main one and smaller sewer channels running throughout the terrain. Or, alternatively, put the canal on a layer that I can turn off? I'm not considering optional layers for this map. They're just not practical in this format. Glad you found the Cobblestone Streets Map. I was in the middle of suggesting it! I honestly didn't give any thought to which models should be placed on these maps. That's for you to decide.